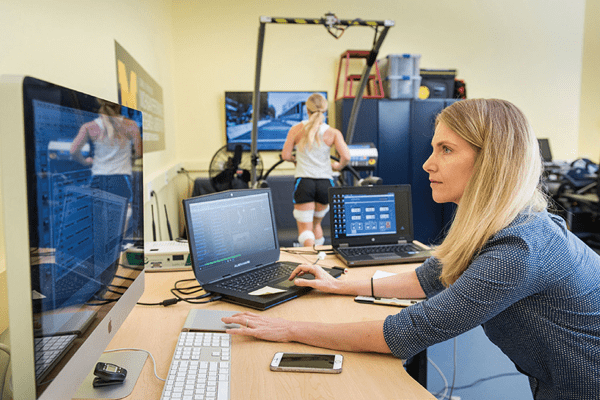 Drawing on expertise across the University of Michigan, Michigan Athletics and industry partners to optimize physical performance and health for people of all ages and abilities. The development of sensors, wearable technology and materials, smart apparel and safer equipment can intelligently manage a person’s wellbeing and behavior in a personalized manner. Researchers are working to develop and enhance sport technology in an effort to optimize performance, identify better methods to diagnose or evaluate potential for injury, and develop more informed approaches to optimally return the injured to play. 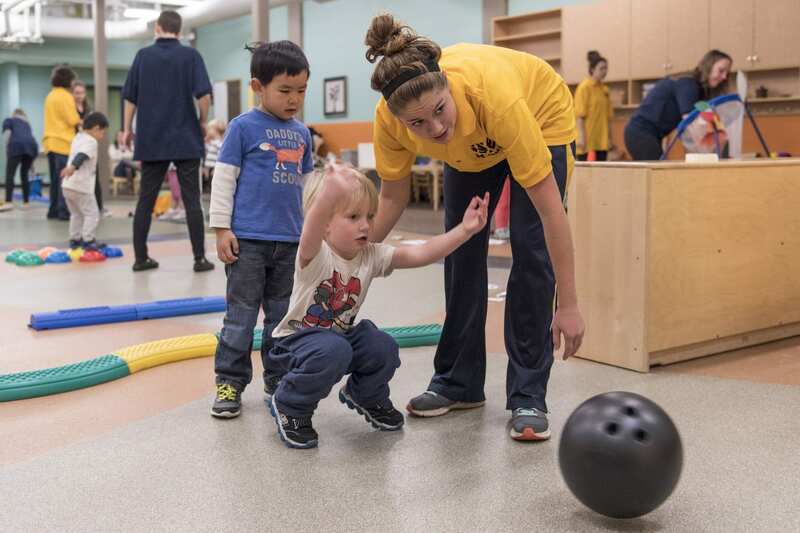 At the University of Michigan, researchers are developing strategies to promote, encourage, facilitate and improve physical activity across the lifespan for people of all ages and abilities. Research areas focus on nutrition and hydration; strength training and conditioning; sleep, rest and recovery; sport psychology; and injury prevention. 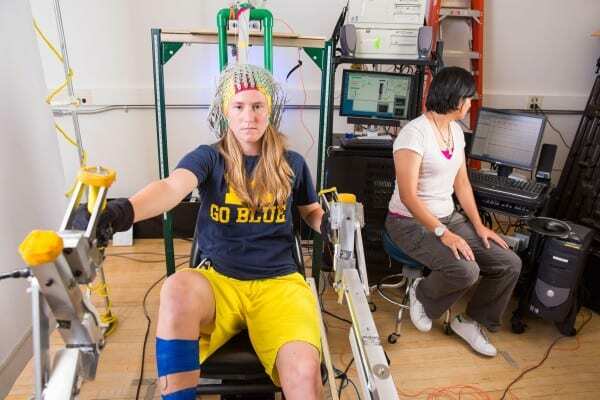 University of Michigan researchers are working closely with athletes and industry partners to develop safer equipment that helps prevent injury. Researchers also are working to identify better methods to evaluate potential for injury or to diagnose injury (e.g., concussion), as well as more informed approaches to optimally return the injured to activities. The translation of a myriad of data from multiple types of sources on a person’s training, nutrition, movement, biometrics, and sleep can spur actionable approaches to reduce injury risk and achieve performance goals. Researchers are using data science to analyze individual athletes in relation to everyone else on a team, while also analyzing team data as a whole. 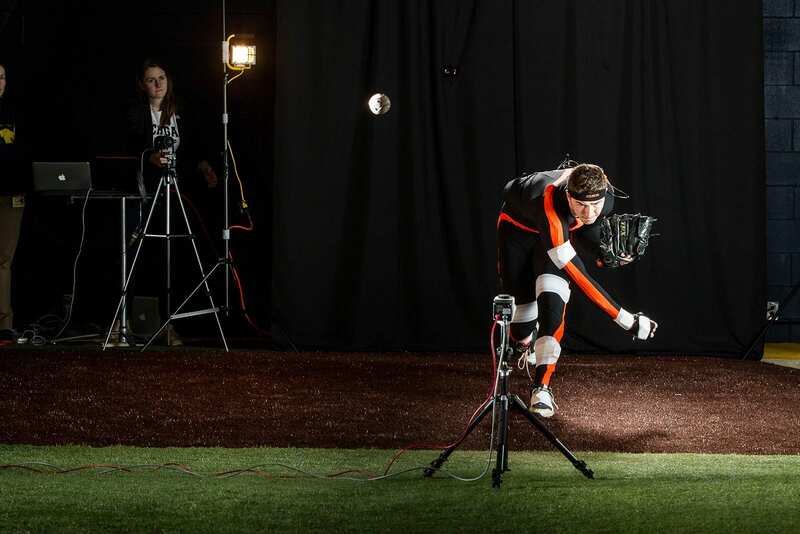 They also use data for purposes of individualized augmented and virtual reality, which can enable athletes to accurately self-assess their performance. ESSI draws on unparalleled resources to address the challenges in exercise and sports by engaging faculty and student researchers across campus; student-athletes, coaches, and trainers; and industry, foundations, and professional sport teams and leagues. ESSI performs cutting-edge, interdisciplinary research and ultimately translates findings to the public in a variety of sport science topics, including individual and team analytics; wearable sensor technology; psychology; equipment and apparel design and safety; injury prevention, diagnosis, and management; strength and conditioning training; nutrition and hydration; and rest, recovery, and regeneration. ESSI will promote the fitness, health, and well-being of students, of athletes at all levels, and of society by encouraging the transfer of emerging insights and innovations into practice in the classroom, on the playing fields, and in communities, as well as through sport analytics, proactive communication and outreach, and commercial applications. As a University-wide initiative, ESSI has access to a tremendous breadth and depth of expertise across 19 schools and colleges, thousands of athletes at all ages and abilities, a world-class health system, and state-of-the-art academic and athletic facilities. © 2019 Exercise and Sport Science Initiative. Michigan Web Design by Boxcar Studio.